Grand JunctionGrand Junction — In a play-before-you-pay effort to attract more people to hunting, this year Utah is offering a program where any licensed hunter 21 years or older can take a person 12 years or older hunting. — In a play-before-you-pay effort to attract more people to hunting, this year Utah is offering a program where any licensed hunter 21 years or older can take a person 12 years or older hunting. Grand Junction — In a play-before-you-pay effort to attract more people to hunting, this year Utah is offering a program where any licensed hunter 21 years or older can take a person 12 years or older hunting. The licensed hunter does not need to be a trained hunter-education teacher nor does the first-timer need to have taken a Hunter Education course. The only requirements for Utah’s new Trial Hunting program is the “student” possess the proper licenses and permits and complete an online Trial Hunting Program orientation course. Kirk Smith, Hunter Education coordinator for the Division of Wildlife Resources, says Utah’s program gives people a chance to try hunting before committing to a Hunter Education course. The Utah program is based on similar trial and apprentice hunting programs in 35 states. 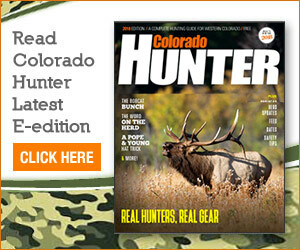 Colorado still requires all hunters to have completed a Hunter Education course prior to purchasing a hunting license. To counter concerns about the safety of such a program, the Utah wildlife agency looked at the safety records of similar programs in other states. Interested persons can participate in the Trial Hunting program for three years. If they decide to continue hunting after that time, they must complete a formal Hunter Education course.